As you may well have worked out from my vague post the week before last, Claire and I spent the weekend of 6 - 9 March in Seville, and what a wonderful weekend it was. It all started with a nice and early (3:20am) rise-and-shine on Friday morning so we could get to the off-airport parking and then on to the airport for our 6:20am flight - the first flight out of T3 for the day. 2. because it was cheaper than using the RailAir coach when you take into consideration the taxi/trains we'd have to pay for on top of the RailAir ticket to get to and from Reading. It turned out to be a good choice too as we could sleep just that little bit later (like it really made that much of a difference) and the M4 was nice and quiet so we made it to Heathrow in good time. Checked in. Waited. Delayed due to ice on wings. Took off. Flew. Landed in Madrid. Dashed to next flight gate. Delayed (what do you expect, it is Spain after all). Took off. Flew. Landed in Seville about an hour later and late. Caught the EA bus at a bargain price of €2.30 each to Santa Justa railway station. Walked to hotel and checked in. Now here's a tip for those traveling to Seville on a budget - don't catch a taxi. Catch the EA bus. It's considerably cheaper (the taxi costs about €20) and it really doesn't take that long. We opted to get off at the train station and walk the 1.5 miles to our hotel as it was a much shorter walk than catching the bus all the way to the end of the line at Prado San Sebastian. It was also close enough that we really didn't need to catch another bus, though there are plenty if you need to. Seville is tiny in comparison to most other cities, so most hotels are well within walking distance of one of the stops on the EA bus route. Once checked in, it was time to explore this wonderful little city. With tourist map in hand, camera all loaded and set, we headed into town and walked and walked and walked. That pretty much ended up being the theme for the weekend - walk, walk, walk, drink beer/wine/fino and eat tapas and then walk some more. The weather was gorgeous too, so much so I got a touch of the old pink forehead treatment too. One thing I wasn't expecting about Seville was the orange tree lined streets. I'd heard about Seville oranges, but I just thought they were a type of orange that grew particularly well in this region. As it turns out, lots of the roads and "plazas" have orange trees loaded with beautiful bright plump oranges and it really adds a lovely bit of shade and colour to the streets. 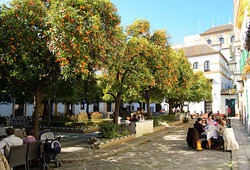 Given the bitterness of the Seville orange, no one seems to pick the oranges either so I'd expect these trees to look fabulous for most of summer, or until the main tourist season when eager tourists discover why no one else has picked the oranges yet. 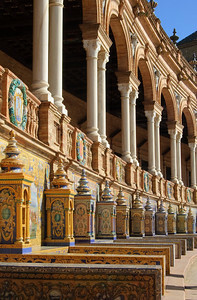 The architecture in Seville is an amazing blend of influences and is evident in most of the buildings, especially in the huge cathedral in which you can see the different influences all in one building. Just be careful you don't walk into anyone as you'll be spending a lot of time looking up. Oh and Seville also seems to have a fancy for mustard yellow and white. Claire and I did something this holiday that we normally don't do: we paid for breakfast at the hotel - in advance as it came out waaaaaaaay cheaper and far better value. Normally we just grab a coffee and sandwich/cake/pastry for breakfast from a near-by cafe and then hunt for ages for lunch when we get really hungry. By paying for breakfast in advance, we forced ourselves to fill up early in the day and get out earlier. This was particularly useful as we got to see some of the sites before the crowds built up and before it got too hot. Plaza de España is just one of those places where you'll get more by getting there early, as we did. It's amazing and I managed to get loads of really good pictures without too many people getting in the way. We also managed to miss most of the heat as Sunday was particularly toasty in the afternoon. The Reales Alcázares was also very impressive and well worth the €7.50 entrance fee. The gardens are immense, spectacularly maintained and these alone are worth the entry fee. We spent the best part of Saturday afternoon at the Alcazar and could probably have spent even more time if we weren't booted out nearly an hour after they closed - we thought they closed at 7pm, not 5pm - ooops. Seville doesn't seem to do restaurants very well - they're there, just few and far between. Apparently the locals would rather eat tapas than a full meal, hence there's an abundance of tapas bars, but not many restaurants. That said, the tapas is available in large dinner plate sized portions (called racións) so you can easily share a couple of these or go for a few more of the tapas and get a good variety of flavours. We opted for this approach after not having much luck finding a restaurant we fancied, and it was definitely the best choice. 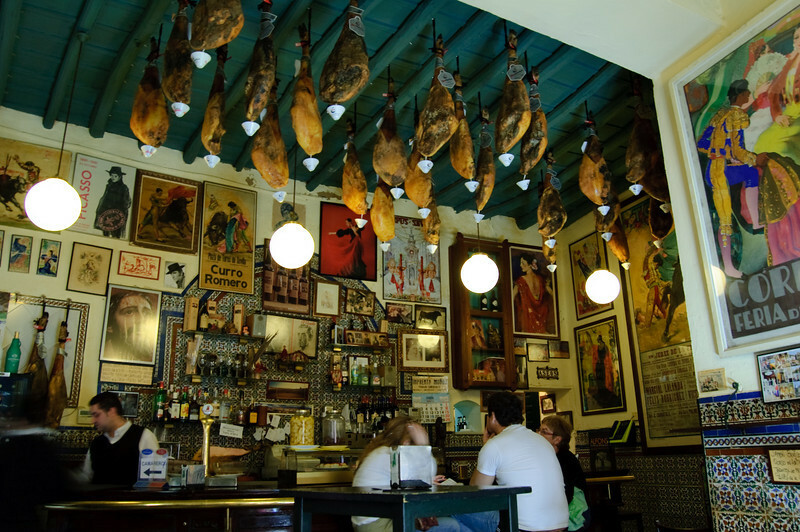 We also found an awesome little tapas bar tucked away in the Santa Cruz part of town with the kind of decoration you'd expect in a Spanish tapas bar, including the hams hanging from the ceiling - click the image to see what I mean. Seville is a fantastic little city with soooo much to see. It's also small enough that the only way to really see it all is to walk, especially as parking is likely to be a nightmare and driving won't allow you to see all the little narrow pedestrian side roads. I highly recommend getting up early too. You'll miss the crowds and the heat. This is definitely one city I'm glad to have visited. Thanks to a new found ability in Lightroom, I've managed to turnaround the photos from a holiday in the quickest time ever - less than a week. The slideshow of all the photos is here for your enjoyment.